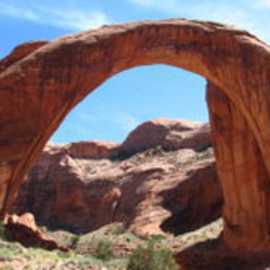 Considered sacred to neighboring Native American tribes, the world's largest natural bridge is located in the Glen Canyon National Recreation Area, and is accessible only by boat (approximately 50 miles from marina). The span has undoubtedly inspired people throughout time—from the neighboring American Indian tribes who consider Rainbow Bridge sacred, to the 300,000 people from around the world who visit it each year. 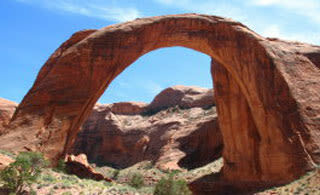 Please visit Rainbow Bridge in a spirit that honors and respects the cultures to whom it is sacred. A courtesy dock is available for short-term docking during the half-mile walk to the bridge.